Rino the owner of Helvetia make your staying perfect. With his good conversation, always a glass of wine to offer you and best tips about the city, my stay in Helvetia was one of the bests of my trip! truly recomend the hostel and have plans to come back as soon as possible. Stayed there last year and had a great experience at the hostel! Great location, kitchen, great rooftop, clean, comfortable! Everything 10/10! Everything was fine, Rino was so kind, received us with coffee and helped us with our luggage since we arrived until we left. 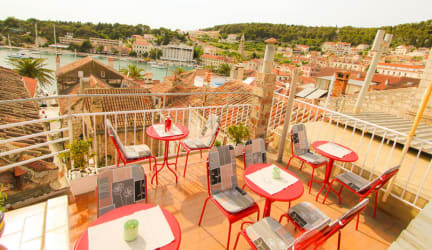 The localization is very good, everything cleaned and working well... only the wifi that wasn't thaaaaat good, but our days in Hvar couldn't have been better! Somethings just disappeared of my backpack, when I asked in the reception if the woman who clean the room might've gotten my clothes when she was changing the bad, they really didn't care. Also, at 10pm the lights in the rooftop turn off and you cannot use this space anymore, and you are not allowed talking too, it means no calling using the hostel wifi, as the owner said: "it is my house". It was awkward but fortunately I met great friends over there and I had a great time.